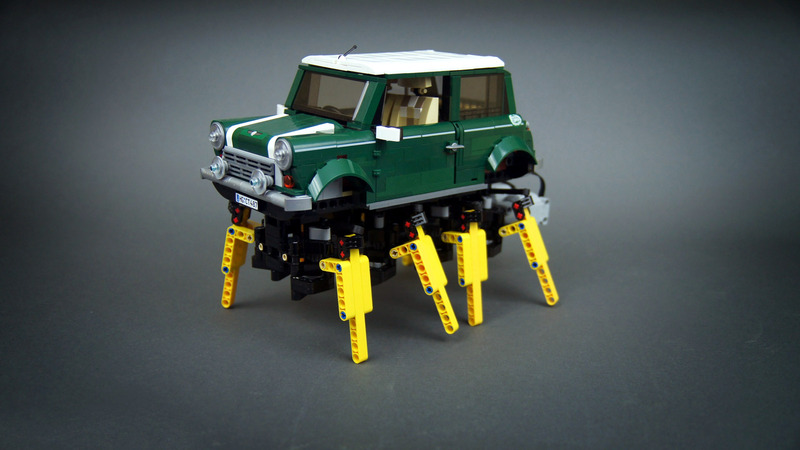 My second modification of an official LEGO set – the LEGO 10242 Mini Cooper walking on eight legs. After I have equipped the body of the Lego 10242 set with tracks, I removed the tracks and chassis but kept the body intact. For a while I was wondering what else I can do with it before I strip it down once and for all. At some point I got curious if my old simple walking mechanism could carry it, and how stable it would be. Building this model was fairly easy: I took the mechanics from my Octopod walker, strengthened and slightly widened its torso, and reworked legs to make them spaced closed together and thus fitting under 10242’s body, and to make them operate at angles better suited for carrying weight. 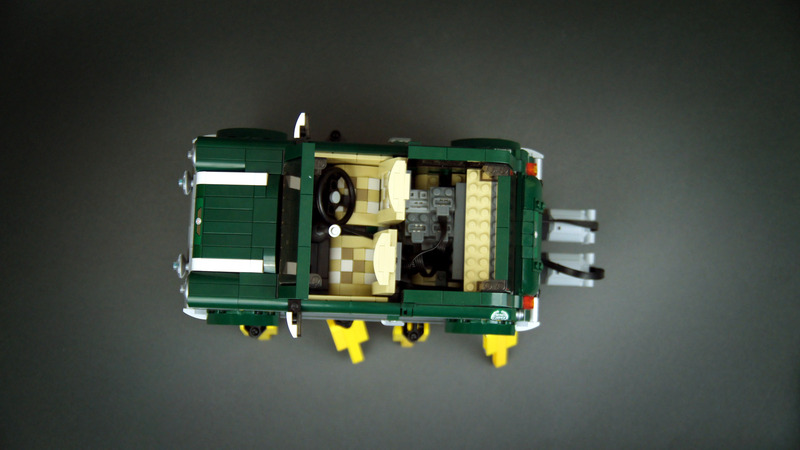 The 8878 PF battery ended up inside the trunk, and SBrick was installed behind driver’s seat. 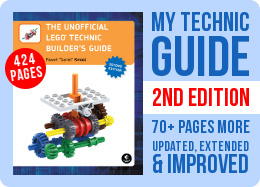 I also kept the front Lego LEDs that were there since my previous 10242 modification. In the end, the model proved to perform way beyond my expectations. 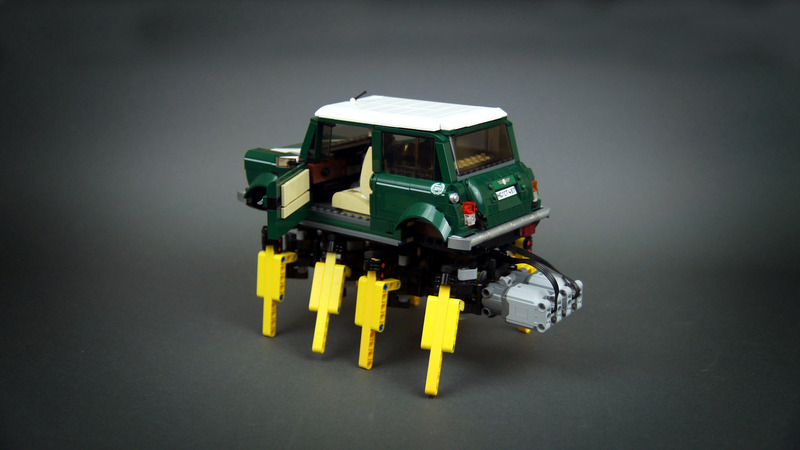 The modified legs made it extremely stable – there was some bobbing up/down involved, but no sideways movement under any conditions – whether going straight, making a turn, or turning around in place. 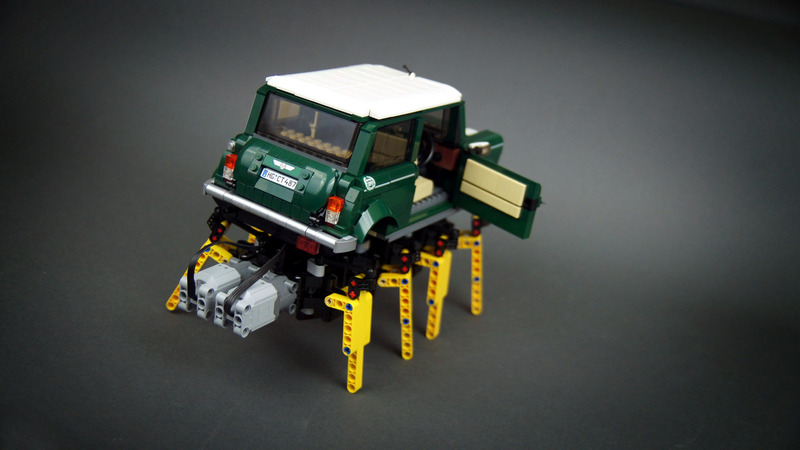 Thanks to the reinforced torso and to the use of PF L motors, it was also able to move at similar speed as my original Octopod, despite being more than twice as heavy. The SBrick performed fine and allowed fine control over the walking direction, as I was able to precisely control speed of each of the two motors. 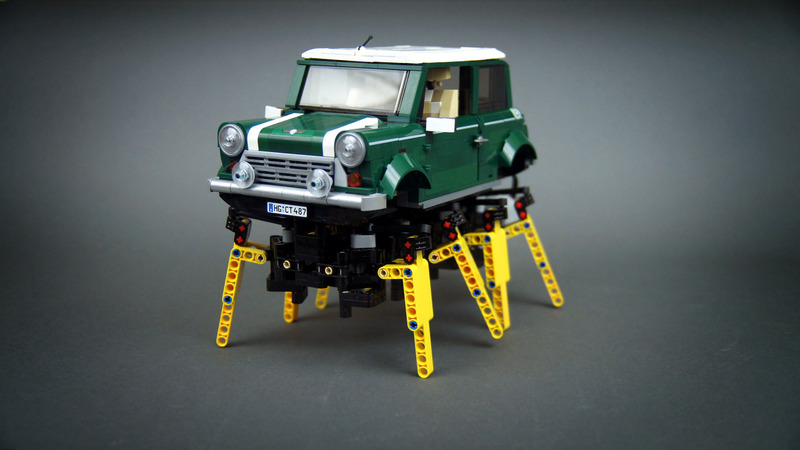 It was a very funny model to watch and to play with, and it demonstrated how much performance of a walking mechanism is affected by the geometry of its legs. Just a few changes made it much more stable than the initial version, and capable of carrying impressive load. 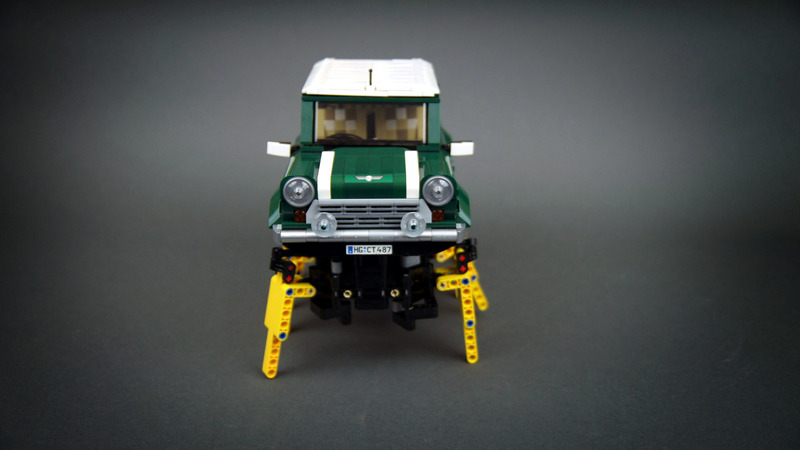 I only wish I could make a really fast walker, but given the complex forces acting on its legs and torso, this seems unlikely to achieve with Lego pieces. If they don’t go up and down, how is your mechanism going to move? You know, the legs have to go forward, then backward. If they don’t go up and down, it means they touch the floor when going forward and when going backward. And as for reinforcing – the piece you want to use is quite easy to rip out. The essential problem is that the more you reinforce a walking mechanism, the bigger and heavier it’s going to be, requiring reinforcing even more. 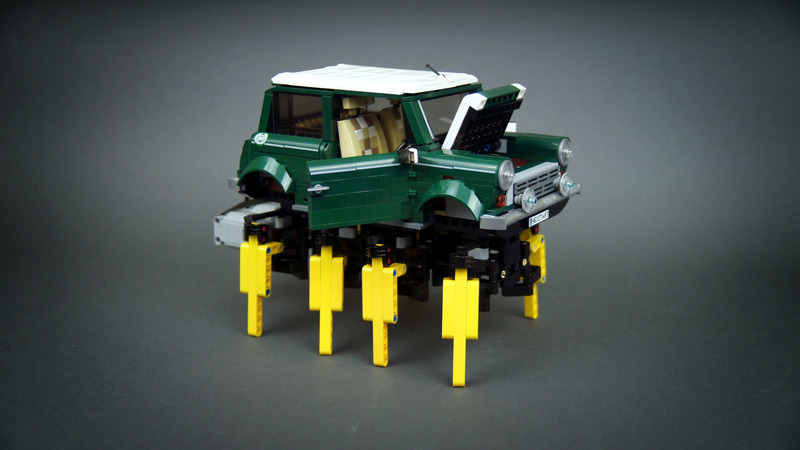 If I would build a fast walker ( I may will when my car is done ) I would use a different walking mechanism where the legs go in a straight line and dont move up and down, anyway. And how are you going to reinforce links and towballs they sit on? That’s the weak link. 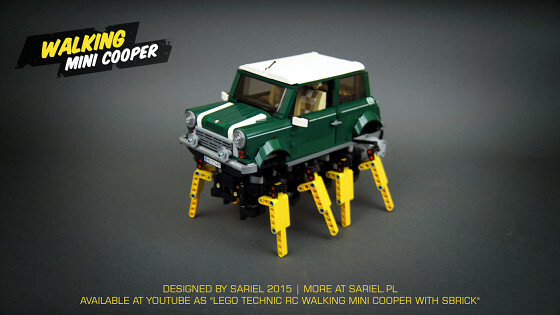 You said you thought a fast walker was not possible with lego because of al the forces but why? I mean if one built a walker with a three- dimensional hull instead of two thin beams as chassis and reinforced the legs against all forces acting it might be possible to make a faster one. A kind of suspension to soften the up and down movement would maybe help, too. Just a thought. No idea. I haven’t tested it on sloped surfaces. I see. 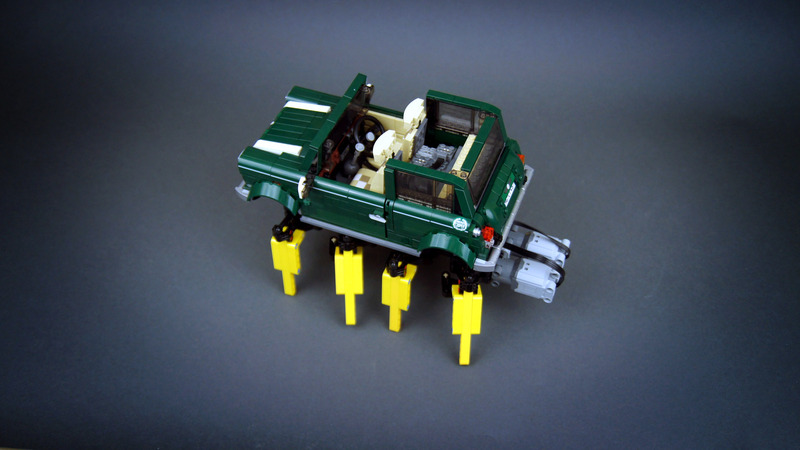 Was the traction adequate even on sloped surfaces? Yes. This walker is much heavier, so it has better traction on plastic legs. At the same time, rubber tips would bend under pressure, generating plenty of friction for the motors to overcome. Very cool modification; I’ve always been a big fan of walkers! 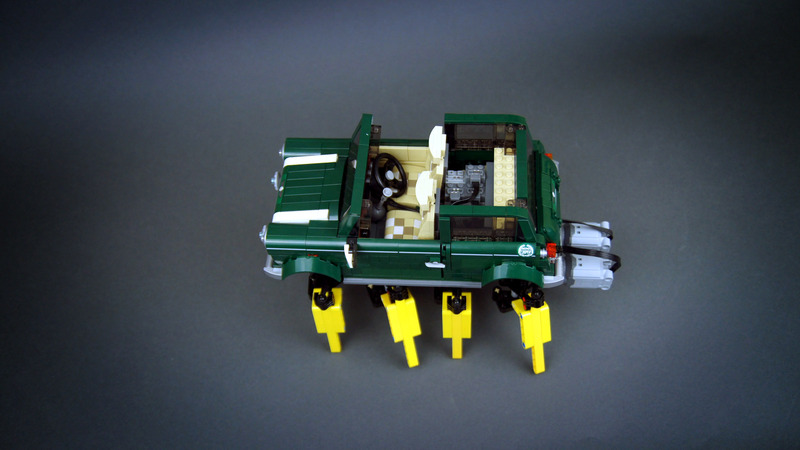 However, I noticed that, unlike your original Octopod, you didn’t use rubber tips on the Mini’s legs. Was there any particular reason for this? I tried that, they would tear the mechanism apart. The problem is that a walking chassis has much more structural stress to handle than a wheeled one. 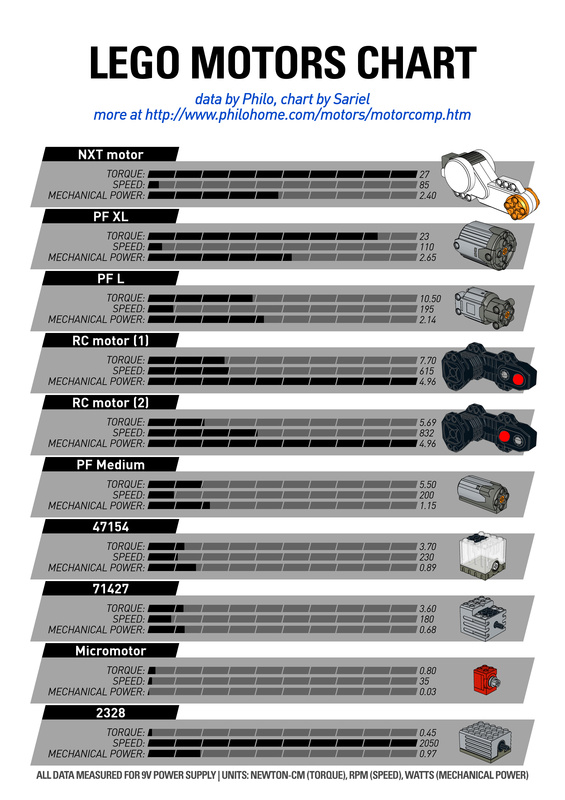 What would happen if you replaced the l motors with rc motors? just an idea and great work!